Every organization, just like every society, has a culture that defines its essence. Culture is the fundamental value and belief structure of the organization collectively shared by the employees that is symbolically expressed in a variety of overt and subtle ways. The type of people in the organization as well as the corporate symbols, slogans, and philosophies are all clues into corporate values. Corporate culture influences the organization in a number of ways. It influences how an organization analyzes and solves problems as well as how the company responds to change. It also affects employee motivation and customer satisfaction. How do managers impart the culture? Some ways include: (1) using the socialization process of a new employee to reinforce the organization’s value structure, (2) linking values with specific behaviors, and (3) developing symbolic reminders of the core values. The purpose of this case is to learn how to create and sustain cultural values. You’ve entered the CEO’s orchid-filled office and notice a randomly stacked set of books on storytelling such as Story Factor by Annette Simons, Managing by Storying Around by Armstrong andSquirrel Inc. The CEO of this 500 employee printing firm explains that he has become “enamored” with the idea of managing through storytelling and points to the stack of books. He notes with frustration that he devotes hours to creating timetables, schedules, goals, and policies. He also acknowledges that when he comes face-to-face with employees he will often decide to alter his plans or policies because of their concerns. In fact, some employees have secretly called him a “girly-man” even though they recognize his extraordinary abilities to work with big-name clients and consistently provide a good return to shareholders. He wants you to come up with a list of actionable ideas to transform his company from one driven by policies and schedules to one inspired by stories and a commitment to customers. Develop a critique (strengths and weaknesses) of the existing managerial philosophy. Create an alternative story-based approach outlining a strategy and related tactics. Provide a critique of the story-based approach (strengths and weaknesses). Suggest an implementation schedule based on sound communication principles. 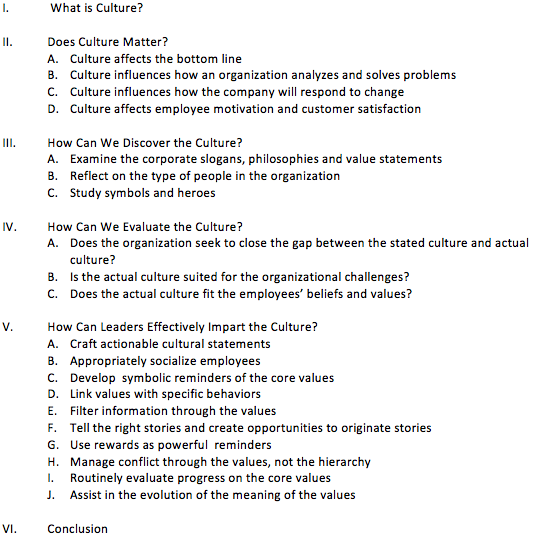 The purpose of this case study is to analyze the impact of organizations’ cultural values on communication patterns. Select two companies to compare and contrast. Collect various “artifacts” (slogans, corporate philosophy, etc.) which are representative of each company’s culture. Conduct interviews with various employees to determine organizational heroes, stories and values. Determine two or three critical values of each company that are suggested by your research. Find specific evidence from your research that supports your selection of the values. Discuss how the values are communicated in each company and how the values interact with one another. Determine the likely communication strengths and weaknesses of the companies based on the above analyses and your knowledge of organizational communication. Provide sufficient rationale for your speculations. Speculate on the “health” of each culture. Compare and contrast the cultures of the two companies. Summarize what the exercise has taught you about communication and organizational cultures. What parts of the “on boarding” or socializing clip did you find most effective? What parts of the “on boarding” or socializing clip did you find least effective? What is the likely impact of such a clip? What do you know about story telling that you didn’t know before? How could you improve your own story telling? Have you ever seen an organization tell its story in a way consistent with principles outlined in this video? If so, what was the organization? How did the organization deliver the story? What surprised you the most about the movie? What specific translation problems appeared to be most difficult to surmount? How do the ideas from the movie mirror the challenges outlined in the chapter? Select a particular organization that you are familiar with. Identify three specific signs that point to core values deeply held by the organization (recall Table 4.1). Select two companies that produce the same products or provide a similar service. How do their cultures vary? What difference does it make? Think about two companies considering a merger. They want to know the degree of compatibility between the cultures. Develop a short ten-item test that could help make that judgment. Provide your rationale. What key principles in the chapter does this video clip illustrate? Was the speaker effective in communicating the values of the organization? Why or why not? Based on the chapter, how would you improve the speech?